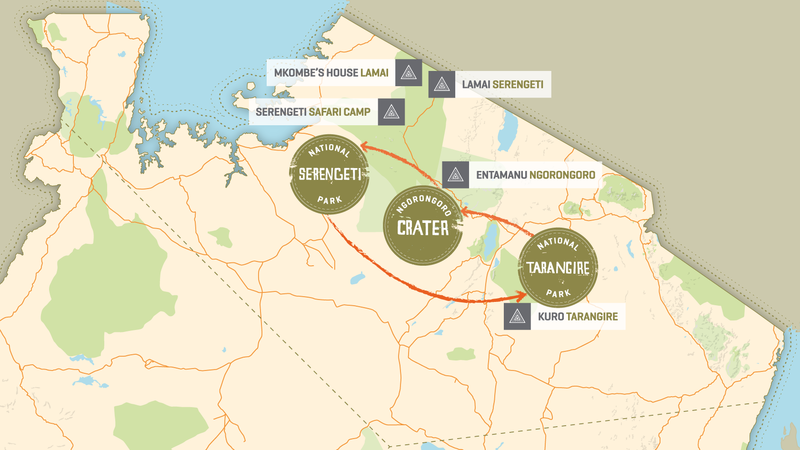 We have a complete circuit of camps through Northern Tanzania. Our Northern Tanzania camps are in enviable locations that mean we can take you deeper into this epic wilderness. Tucked away, off the tourist trail, but in extraordinary wildlife areas a safari spent in our Northern camps is not to be missed. This organic, light-footed camp hidden away in the park, is probably closer to our hearts’ core than any other. Naturally, our take on this wildlife Shangri La is wilder, woolier and so much more absorbed. The only self-contained private house in the Serengeti. Lamai Serengeti’s little sister, exclusively for private groups. You can combine any of our camps to create the ultimate safari experience, whether you are staying within any one park or across regions. Northern Tanzania has long been a favourite stomping ground for us Nomad folk and we know this region better than most. We were the first company to create a mobile tented camp that shadowed the migration around the Serengeti, and our Serengeti Safari Camp still continues this odyssey to this day. Our other camps are all tucked away in hidden corners of the parks, Kuro Tarangire nestles right in the beating heart of this beautiful park, Entamanu Ngorongoro redefines the Crater experience on our very own wild side of the Crater rim, and Lamai Serengeti, along with Lamai Private and Mkombe's House Lamai stand proud above the Northern Serengeti grasslands. This is a route that is well trodden in Tanzania, so it is important to us that you see it as we did all those years ago. Our team of intrepid and highly experienced Northern guides love nothing more than the discovery of hidden gems on the roads less travelled. Mark and Milly Houldsworth, together with Mkombe Mniko started Nomad Safari Guides some 20 years ago. It is their pioneering spirit and the belief in investing in local guides and communities that drives our Northern Tanzania operations today. From the outset, Mark, Milly and Mkombe hoped to create a showcase for the top Tanzanian guides. This team developed a reputation we work hard to maintain today and still champion as the single most important factor on any safari. In the late 1990’s Mark, Milly and Mkombe moved up to the Serengeti to start their Nomad Safari Guide operation. With just two old Land Rovers and a pile of secondhand safari kit, they developed the first mobile camp to shadow the migration. Mkombe tragically passed away in 2008. He exhibited the enthusiasm and child-like excitement for being in wild places that we carry with us to this day. We’re proud that there is a corner of the Serengeti that now carries his name at Mkombe's House. A spot of low flying to clear animals off the airstrip before landing at Loliondo. Mark's wife and fellow Nomad founder Milly on a walking safari during a trip to the Selous Game Reserve. Outstanding! We are sorry to leave! The focus of the camp is a great angular barn of a building, its shaggy grass roof providing shade from the sun, while its sides are open to the cooling breeze. It is obvious that the company culture is about attention to detail, providing a great experience in every way, taking care of the employees and giving back to the community.